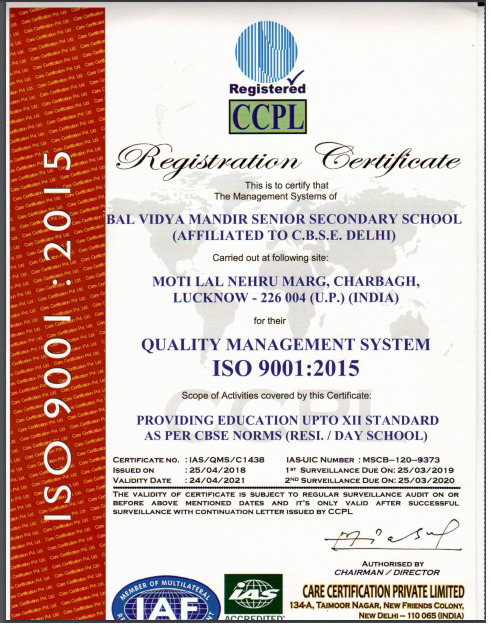 Bal vidya mandir senior secondary school was started in 1963 under the auspices of the Motilal Memorial Society, founded by the late Chandra Bhanu Gupta,the then Chief Minister of Uttar Pradesh on Pandit Motilal Nehru Marg,Charbagh,Lucknow. The foundation stone of this school was laid by Late Lal Bahadur Shastri,the then Prime Minister of India. The Institution,affiliated to CBSE,Delhi,imparts education from Nursery to Class XII to children,both boys and girls from the age group of 3 onwards. The Institution is housesd in a spacious building amidst picturesque surroundings. The Institution has a well-equipped Library with a large collection of books on varied subjects, which helps in exploring the realm of knowledge.Adjoining the school is the Bal Sangrahalaya,which is an education system in itself. Though Bal Vidya Mandir Senior Secondary School runs on Public School lines, yet it is deeply rooted in Indian thought,culture and traditions. The education system of the school is formulated to facilitate the all-round development of the children. Children are encouraged to manage their affairs themselves as far as possible through inculcation of self-discipline,self-service and an organize Prefect system. Moral education is an integral part of the school curriculum which helps in instilling the sense of moral duty and dedication in the students to their Alma Mater. The school has made every effort to realize the dream of the great educationists loke Froebel and Maria Montessori. The seeds of punctuality,personal hygiene and good conduct are sown and nurtured right from Nursery section of the school,which is one of its own kind. BVM is a "Temple of Learning" in its true sense which aims to enable each student to succeed like success itself.